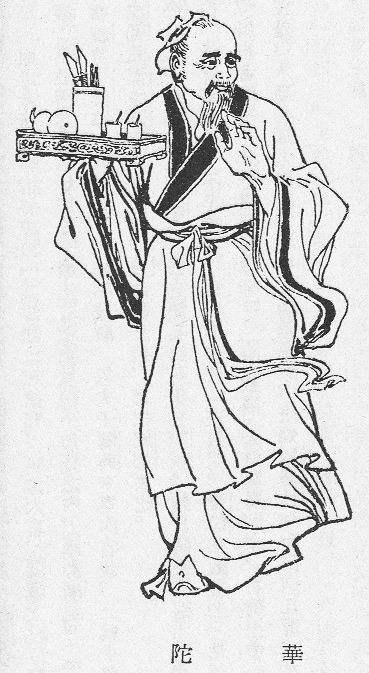 Huà Tuó (AD 141-208) is known as a famous physician. Any Chinese acupuncturist knows of Huà Tuó and his medical discoveries. In fact there is an associated-shu point named after him M-BW-35 “Huà Tuó ’s Para-vertebral Points”. He was the most prominent physician during the Three Kingdoms Period. In fact he treated last emperor of the Han dynasty. Huà To performed brain surgery removing a tumor from the emperor. His patients ranged widely in status and wealth. Many of the predominant members of society called upon his acupuncture skills as well as his abilities in surgery and medicine (herbs). He was well ahead of his time. Many of his discoveries are still in Chinese medical practices today. One of his famous patients General Guān Yǔ was supposedly shot in the arm by an arrow. It is not clear if the arrow was poisoned or if the general’s arm had become infected, either way he was expected to die. The infection/poison was located in the bone of the arm, so Huà To was called upon to treat the general. An anesthetic herbal blend was used on most of the patients undergoing surgery by Huà To. General Guān Yǔ refused the narcotic mixture and chose instead to play a game of chess. Huà To treated the affected area by scraping the affected area until the blackened area was no longer in the arm or on the bone. The general sat playing his game and drinking some wine. Apparently his work was a success. General Guān Yǔ had engaged in several other battles before his death. Cáo Cāo a ruler of the Three Kingdoms called upon Huà To for treatment, but instead executed him by beheading. He felt Huà To could not be trusted. Huà To died at the age of 67. Oddly enough, Cáo Cāo is the same ruler who executed General Guān Yǔ by beheading as well. As martial artists we know Huà Tuó not only for his medical abilities, but also for his Qì Gōng exercises. Consisting of Qì Gōng exercises Huà Tuó’s Five Animal Play is used to stimulate meridians of Chi in the body. As a physician he was familiar with these points and channels on the body. He developed corresponding exercises to open these pathways. The majority of martial artist are familiar with two famous types of exercises Live and Dead training. There is also another called Xiān Tiān Qì (or Hsien Tien Chi) training as well. These types of training combined together are a great way to invigorate the meridians and channels, while getting the benefits of a great work out. Huà Tuó’s theory “The hinge of a door that is often opened and closed never rusts”.